Home › SAT Subject Tests › Use That Calculator! Your calculator is your friend on the SAT Math Level 2 test, especially on trigonometry problems. Instead of memorizing endless numbers of formulas – double angle formulas, co-function identities, etc. – your calculator can do all the work for you…if you know how to use it. 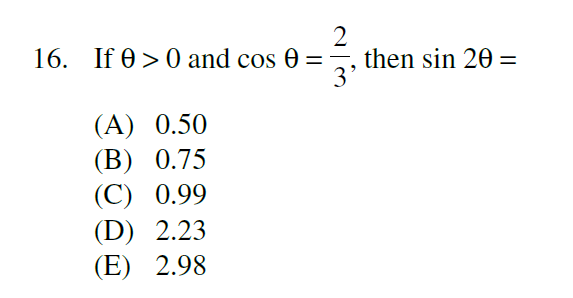 Try this problem, and then watch the solution video. Make sure you have your calculator handy!